The Department for Work and Pensions (DWP) has signed up to the West Cheshire Poverty Truth Commission (WCPTC) pledge, promising to treat all customers openly, honestly and respectfully. The pledge was put in place by the first PTC as community inspirers, who are residents with lived experience of poverty, had been treated poorly by some organisations. By asking organisations to develop two-way relationships with customers rather than it simply being a transactional process, the pledge aims to have a positive impact on the mental health of people in vulnerable situations. 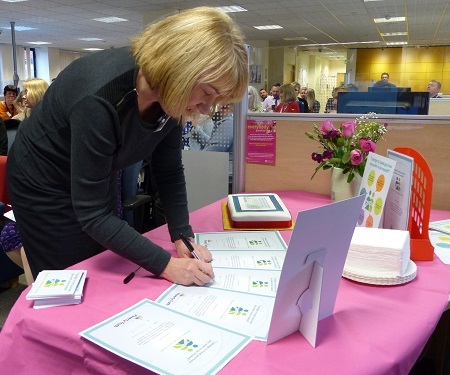 The DWP showed its support by signing up to the pledge at Chester Jobcentre Plus on 16 January. Swampy, one of the community inspirers from the first commission, highlighted how important it was that as many organisations as possible signed up. Adele Ablett, Customer Service Manager at Chester Jobcentre, said: “DWP in Cheshire West and Chester is proud to work in partnership with the WCPTC so that we can listen, learn from and support those who inspire the commission’s aims. Councillor Nicole Meardon, Cabinet Member for Families and Children at Cheshire West and Chester Council, said: “The PTC pledge is important as treating people better, regardless of their situation in life, can only lead to better outcomes for us all. “The pledge is simple, but it is also a very effective tool. If all organisations embrace and support the pledge, it has a big impact and will help us to address some of the issues community inspirers have brought up. “As the inspirers are at the heart of the project, it makes sure the issues that matter most to those with first-hand experience of poverty are looked at, allowing us to make changes that will have a lasting effect. The second commission will officially launch on 31 January 2019 and bring together a new group of community inspirers with civic and business leaders to look at how we tackle poverty across the borough. The DWP has also committed to support the second WCPTC as a member of staff will remain involved as a commissioner. A lot of progress was made during the first commission, which Cheshire West and Chester Council launched in February 2017. Community inspirers visited the House of Commons to speak to MPs about their thoughts on the welfare system, written evidence was sent to the Work and Pension Select Committee and mental health awareness training was put in place for Council frontline staff. The commission received both local and national media coverage. If you are interested in signing up to the pledge, email: WestCheshire.PovertyTruth@cheshirewestandchester.gov.uk or visit: cheshirewestandchester.gov.uk/povertytruth.